Temple was born in Cleveland, Ohio, educated at The Hotchkiss School and Yale University, became a journalist, was nominated twice for the Pulitzer Prize as an undercover reporter at the World Telegram & Sun in New York City, worked as a Managing Editor at News/Check, a weekly newsmagazine in Africa and as an Editor at the Reader's Digest in the United States. He was a copywriter and creative director for large ad agencies around the world, lived in Africa for 6 years and in Europe almost as long. He and his wife live and laugh in Boca Raton, Florida. Warrior Patient: How to Beat Deadly Diseases With Laughter, Good Doctors, Love, and Guts by Temple Emmet Williams is an informative memoir about the author's medical odyssey after being diagnosed with prostate cancer. He recounts his journey as if giving instructions to a new patient and involves readers on a personal level; he also gains insight into his own circumstances. Readers go on the journey of the author's ordeal and experiences, which are horrifying, and the messages in the book are indeed inspiring. The book challenges beliefs and questions medical experts, and motivates readers to do the same more often in their lives. The book helps bridge the gap between healthcare providers and patients. Though the book speaks about the struggle of patients, the author's sense of humor tones down the harshness of his terrible journey. The author's advice to use love, laughter, guts and good medical attention is comforting to readers, especially to those who are trying to recover from diseases. The author's words capture characters, times and places from childhood to old age. The book is helpful in looking at medical issues in a lighter vein and, by the time one finishes reading the book, readers will have received training on how to be a Warrior Patient, and how to add extra sunrises and sunsets to their life if they are fighting to survive. The author's positive energy and will to survive against all the odds is evident. The book also tells readers to listen to their bodies when they are undergoing treatment. An uplifting and helpful read. Warrior Patient: How to Beat Deadly Diseases With Laughter, Good Doctors, Love, and Guts by Temple Emmet Williams is a humorous and inspirational memoir depicting the author’s personal struggle with multiple serious health issues. The author engages readers with an honest, raw and motivational type narrative, describing his three-year medical battle with cancer, kidney failure, infections and more. It was exhausting just reading about what he went through (so many issues and so many doctor visits) but it was very inspirational and refreshing how he kept a cheerful and humorous attitude throughout it all. Positive thinking versus a defeatist attitude can make a huge difference when facing life's hardships. The author also presents the challenge to readers to be an advocate for your own health and body. Always get a second opinion from another doctor (just to be sure of the diagnosis) and always “go with your gut” when making big medical decisions. I found Warrior Patient: How to Beat Deadly Diseases With Laughter, Good Doctors, Love, and Guts to be a fun and motivational read. I think the author’s persistent positive attitude helped him immensely throughout his medical battles. A lot of people (when faced with that many health issues) might just feel like giving up, but not Temple Emmet Williams! I think this book could be a great source of inspiration and motivation for anyone going through a health challenge. Keeping your sense of humor, as well as having a positive attitude, can be the difference between giving up or prevailing over a debilitating disease. Kudos to Temple Emmet Williams for sharing his encouraging story with the world! Warrior Patient: How to Beat Deadly Diseases With Laughter, Good Doctors, Love, and Guts by Temple Emmet Williams is a true story about one man’s fight to survive in today’s medical system, starting with prostate cancer. However, what makes this story unique is the light-hearted, almost humorous way in which it unfolds. Williams is a journalist and editor based in Florida and writes about how he found out he had prostate cancer. This discovery begins a constant struggle that lasts for the next three years. The story tells how he dealt with it using the support of his family as well as humor. After being diagnosed with prostate cancer, Williams underwent a radical prostatectomy. Although successful, the operation’s after-effects led to kidney failure, dialysis, deadly infections, open wounds, a hernia, shingles, and cataracts, all mishaps of our modern health care system. Throughout this, the author maintains a cheerful, optimistic attitude. With the help of his wife, he beats all the odds. Today he leads an almost normal life again with exercise, social activities, outings, etc. as part of his lifestyle. This book serves as an inspiration to anyone undergoing medical treatment: keep fighting with a smile on your face and hope in your heart. Warrior Patient is an extremely well-written book and, considering the subject matter, very light-hearted almost to the point of being funny. However, the humorous tone of the book in no way detracts from the story that is one of survival. The writing is engaging and fast-paced, and fascinating to read. The book is full of hope, humor, the will to survive and is definitely worth a read. Warrior Patient: How to Beat Deadly Diseases With Laughter, Good Doctors, Love, and Guts by Temple Emmet Williams is a story about a person who finds himself diagnosed with prostate cancer. After a fall during a friendly tennis match, Temple Williams learns that he has prostate cancer. What follows is a series of events that reads like a comedy of errors, except that it involves a matter of life and death. After three years, he can play tennis regularly again, having won the war on cancer, catheters, infections, kidney failure, hernia, partial blindness, and MRSA, among others. This book tells how Temple Williams defeated his illnesses and transformed himself into a heroic warrior patient. Sarcastic, funny, informative, inspirational, original, entertaining are just some of the words that can describe Warrior Patient. 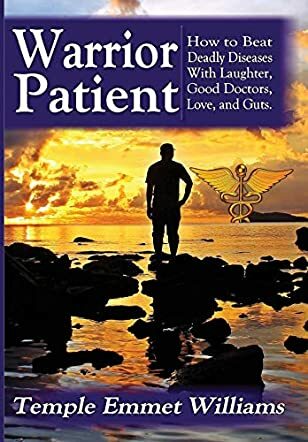 Written by Pulitzer Prize nominated Temple Emmet Williams, this is a book on how to become a warrior patient - a description he invented for people with a life-threatening disease who want to fight it. Temple Williams has a mean and acerbic sense of humor, which is quickly apparent. What is less obvious is that he wants to inspire those who find themselves in a similar medical labyrinth. He wants them to continue fighting for their lives by providing them with an arsenal of hope, love and laughter. As such, this book raises itself to a whole new level, compared to the others of the same genre that sometimes sound like a host of unsolicited advice. Warrior Patient is a story written by a gifted writer and one that should be read by everyone because, after all, human illness is one of the most natural occurrences in the world.